As a blogger, there are only a few very defining moments and this is one of them. An interview with Alyssa Milano. Where do I start? Alyssa is one of the few actresses who, as funny as it might sound, transcends generations. For example, my brother who is ten plus years older than me and pretty much grew up in a different world than I did, had a crush on Alyssa growing up, the same way I did. I mean, who did not watch the show “Who’s the Boss”? Fast forward twenty years later and I was of course happy to find that Alyssa was active (and verified) on my favorite social network, Twitter. However, that happiness pales in comparison to the excitement I felt when I received an email notification that Alyssa Milano was following me. I remember DMing (direct messaging, something you can only do once the person follows you) her and trying to verify that it was really her. Of course, had it not been, and some old man would have been behind that account, he would not have admitted it, so my question was kind of pointless, but I will never forget her answer. She said she takes her Twitter account very seriously and her followers even more, and she would never let anyone else have access to her Twitter. That was the first of many direct messages I sent and received from Alyssa, but somehow the fact that I can send Alyssa a direct message never gets old. In her lifetime, Alyssa has already accomplished things people only dream of, and have taken other people generations to achieve. She starred in hit TV shows such as Who’s the Boss, Charmed, Melrose Place, My Name is Earl, and Romantically Challenged. She has also made her contribution to the movie industry with roles in films such as Hugo Pool, Fear, Lady and the Tramp, Wisegal (which she also produced), and My Girlfriend’s Boyfriend. However, Alyssa did not stop there. Her latest role is outside of show business, as a philanthropist. In 2003, Alyssa was invited by UNICEF to become a national ambassador to Angola, Africa. She followed that trip by another to India in 2005 and continues to work with UNICEF on ongoing global initiatives. Alyssa has also worked with other organizations such as Nkosi’s Haven, the GNNTDC, and many others. In addition to all that amazing work, Alyssa is also a successful entrepreneur with a clothing and jewelry line called Touch by Alyssa Milano. Alyssa also wrote a book entitled “SAFE AT HOME: Confessions of a Baseball Fanatic”, in which Alyssa discusses how the love of baseball has contributed to her life and public image. OK, I think you got the picture, Alyssa Milano is a whole lot more than the “Who’s the Boss” girl and it is for that reason that I have been trying for over a year to get an interview with Alyssa. She finally agreed last week and I have been smiling since. So, before I begin the interview, just a quick and humongous thank you to Alyssa for following me on Twitter, all the support she has given me (I find that she is the most influential person I know on Twitter. One RT of my post by Alyssa has been known to bring me 10,000 readers in a span of an hour. She even crashed my site a few times), and for this amazing interview. Her answers, as you will see below, are really thought out and genuine, which pretty much sums up Alysssa Milano and the kind of person she is. 1. Many people will be wondering why a tech blogger like myself is interviewing the “Who’s the Boss” actress, I know just how geeky (and I mean that in the best sense of the word of course) you are, but others might not. Can you tell us a little bit about your techy passions? I’m extremely tech curious. I’m inspired by technology the same way I’m inspired by art or a great piece of music. I love innovation and invention. I’m oddly motivated by great thinkers that look outside the box and become pioneers. 2. You are, in my opinion, one of the most influential people on Twitter (if I am judging by the amount of retweets I get when you tweet a post of mine), how do you explain your tremendous success on Twitter? Well…thank you… But I’m not sure I can explain it. I can only say that I’m dedicated to my Twitter community. And maybe the consistency and dedication has enabled my followers to trust what I’m sharing in my Twitter feed. I take it all to heart and maybe people can feel that. I realize that people have a choice to follow me or not and I try to show appreciation. I also just try to strike the balance of sharing a part of myself and relevant information. 3. One of things that people love about you on Twitter is that you are not like the other celebrities who don’t give the little people the time of day. You reply regularly to people with less than 10 followers. How do you stay so grounded in the world in which you live, ie show business? I stay grounded because I was raised that every single person on this planet is created equal and that family, love, and friendships are bigger than anything that goes on in show business. And I reply to people on Twitter because I’m not sure I understand the point of being on Twitter if you’re not going to interact with the community. In the 3 dimensional world, if someone pays you a compliment, any polite person shows gratitude and at least say, “thank you”. Why would it be different in the cyber world? If someone reaches out to me and it catches my eye, the least I can do is type a few words and click enter. It takes seconds to put a smile on someone’s face. Why would anyone NOT want to that? AND… I’ve been on the other side! Ha! I’ve reached out to quite a few celebrities on Twitter to no avail. Always bums me out. 4. Besides tech and acting, you have been known to take interest in other industries such as fashion and baseball, can you tell us a little bit about those interests and when they started? I love sports! Like most little girls that love sports, I think it began with wanting to have passions in common with my dad and brother. About 4 years ago, I was at a Dodgers game and went into the stadium shop to find something I could buy to fly the team colors and show my team spirit. The only items available were boxy tee-shirts and baggy hoodies. And… much to my dismay… there was a lot of pink. I couldn’t find anything fashionable or flattering available for female sports fans. I went back to my seat and thought to myself – if I was looking for quality female fan apparel, then surely other women were as well. So, I pitched the idea for TOUCH to MLB Properties, partnered up with G-iii Sports, and within 4 months my first collection was being sold in stadium shops, on mlb.com and in specialty stores around the country. MLB had the exclusive for the first year. In year two, I had the licensing for NFL, NBA, NHL, NCAA, and MLS (http://www.fandalia.com/). And now in year four, TOUCH is available on all the league dot coms, in stadium shops, specialty shops, department stores (Macy’s and Bloomingdales) and we’ve opened two TOUCH Boutiques – one in Citi-Field in New York and one at Consol Energy Center in Pittsburgh. I’m ridiculously proud of the line but the most rewarding part is the response from women. I’m beyond happy they love it and appreciative they’ve embraced it they way they have. 5. As for your acting career, do you still find that people remember you as the “Who’s the boss girl”? Is it hard to break away from that image? It’s generational. People my age and older remember me from “Who’s The Boss?” and the younger generations know me from “Charmed”. It was difficult at 20 to break away from the “Who’s The Boss?” image and it was important to me then to prove that I wasn’t just a sitcom kid and that I did have actual ability. I felt I had a lot to prove. But at 37… I’m just happy to still have a career in this crazy business and be allowed to do what I love. I also feel blessed that I’ve been able to be in shows that have resonated with people. At this time in my life, I don’t want to break away from any of it. 6. I know you are very busy with your career, can you give us a sneak peak into the future of your acting career? What can we expect to see? 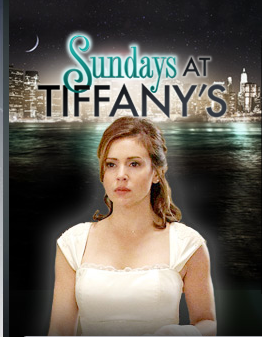 I have a few things happening – My movie “Sundays At Tiffany’s” airs this coming Monday on Lifetime. I did a role in the new Farrelly Brothers comedy “Hall Pass” that will be released in February (trailer). And my independent film “My Girlfirend’s Boyfriend” was just released by Warner Brothers Digital. 7. Since after all this is a tech blog, let’s get a little geeky. Talk to me about mobile and how you see this space in the next 5-10 years. I know you are an iPhone user, but what are your thoughts on Android, BlackBerry, and Palm? I love my iPhone for everything but the actual phone. I had a Blackberry before my iPhone and I liked how basic and utilitarian it was. I can’t comment on the Android or Palm as I’ve never played with either. Obviously, I see the mobile space continuing to grow in the next 5-10 years. How? The sky is the limit. But what I find most intriguing and interesting is how mobile technology will be used to better the lives of those in need in developing nations. I traveled to India with UNICEF a few years ago and I was able to see an SMS outreach program that educated anonymous youth on sexually transmitted disease prevention. I think it’s awesome that mobile technology can connect a teenager in a secluded village to a doctor in the city. So for me… the real question is how will mobile use potentially save lives? 8. What are five of your favorite tech gadgets and how do you integrate them into your day to day busy schedule? 2. My iPad – I use it mainly as a reader when I’m home. When I travel, it has replaced my laptop. 3. My universal television remote – I even use it to turn off my bedroom lights. It’s the little things. 4. My Square! I just used my Square iPad app to collect live donations at an Autism Speaks event. We were able to raise about 9k extra just from using Square. 5. GPS – I’d be lost without it. 9. Since you are so big on Twitter, can you tell me what attracted you to it and when and how you started tweeting? My mother and brother convinced me to join Twitter a couple of years ago, but much like most people who join, I didn’t get it at first. I was kind of lost. I decided to stay with it and do some research. It wasn’t until the protests in Iran that I truly understood the power of Twitter. To get real-time reports from college students being impacted, right to my homepage, was overwhelming. It made this news story something more; something personal. The protests also taught me how I could use Twitter as a platform to raise awareness about issues that were important to me. 10. You have well over a million followers and follow less than 1000 people, how did you select those people and what on earth possessed you to follow a small time blogger like myself (it is still surreal to me every time I DM you)? Ha! I started following you because the people I followed and trusted kept retweeting you and your articles. I select the people I follow many different ways. Sometimes, someone will say something sweet or interesting and then I will monitor their feed for a few days. Sometimes, a trusted source will just recommend a user and I will take their word for it. I follow fans that have been loyal since my first day on Twitter. And I also follow feeds that pertain to my interests and passions. I have friends that are on Twitter that I don’t follow. It just depends. 11. As an entrepreneur, can you tell us a little bit about the different products you are involved in and how you would recommend other entrepreneurs separate themselves from the competition. Do what you love. This is the best advice I can give any entrepreneur. Do what you love. If you love your business, you will always find a way to separate yourself from the competition and stay ahead of what everyone else is doing. I hope you enjoyed the interview as much I enjoyed conducting it. 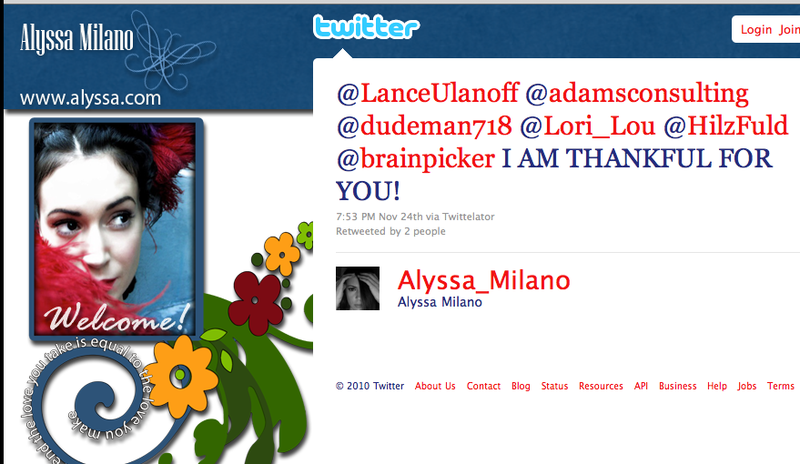 Just one last thank you to Alyssa and on behalf of the entire Twitter community, I can just say I hope she keeps up the good work she is doing on and offline. To conclude, watch the video below of the Old Spice guy replying to Alyssa in one of his famous personalized videos. Hillel, that’s just freaking awesome!! I am the 10+ year older brother and I have to say that there is nothing more attractive than a beautiful woman with intelligence. The crush is alive and well!!!!!!!!!!!!!! BTW, another brilliantly written blog, lil bro. Great interview. Was this interview done in person, over the phone or through emails/DM’s? I’ve now read some of your other blogs and am a true fan. Keep it up. Even *I* had a crush on Alyssa! 🙂 I am exactly her age and, consequently, our hair has evolved very much in sync. I’m thrilled to read that her role-model status does not stop there, but that as a whole human being she is totally worth “following”. And so cool that I know the guy who wrote this! Good 4U, Hillel. I am the 5 year older Brother and all I can say HOLY COW! Loved who’s the boss! was too young to say I had a crush but the brains along with the looks…what a winner! Hillel, unreal that u are interviewing these people! So maybe twitter does make sense! I have a new found respect! Alyssa Milano was my dream girl growing up! Great interview and such a good point about it only taking a few seconds to reach out to someone via Twitter to make their day. It’s disappointing to see celebrities who just tweet their own stuff constantly without any interaction with their fans who are the reason they are celebrities in the first place. Alyssa gets it! Just found the interview great questions and she is one girl who is down to earth and grounded as far as I can see from interviews.And I do have to mention being a huge mets fan I want to know how she became a dodgers fan. Hillel, I didn’t think responsible journalists or bloggers were supposed to gush over their interviews like this … but after the read, I can totally relate. Truly an amazing role model for a myriad of generations 😉 37?! She hardly looks a day older than 24 :D.
Thank you Alyssa for being an ethical twitter crusader, an exemplary Gen-X’er, and for giving ladies something other than an XXL jersey to support my Oilers! Fantastic interview! Thanks to Alyssa for sharing! Alyssa is truly amazing and inspiring. Hillel, excellent work on the interview. Thanks very much for posting it! If I could only follow one person, it would be Alyssa. Real nice interview, some people do stand out even if they are in the show business, especially when they are genuine. Thank you for this great interview… very existing to read it! Many thanks Hillel for the awesome interview.